I bet this violates Facebook's you better not say anything bad about our leader or we'll report you to the IRS policy. Also, give up all paid TV programming, install an HD antenna and watch broadcast before it goes away. That brings up one of my pet peeves (besides Obama). The pic spells "anti-Semitic" as "anti-Semetic." And that's how people say the word, to rhyme with "emetic." It should be said "Sem-IT-ic." But anyway, an accurate depiction of Mussolini for Morons. If there was a spell-checker built into Facebook, nothing would ever get posted. @4 Basil: If there was a spell-checker built into Facebook, nothing would ever get posted. If there was a fact-checker on either Facebook or the Obama Administration, neither would exist! 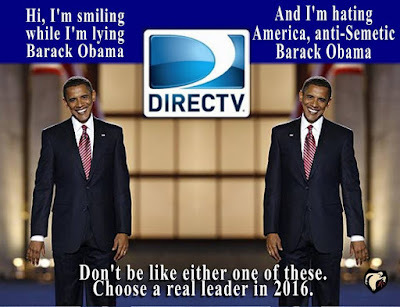 Choose a real leader in 2016? The media will make sure no real leaders are available for the general election. We'll end up with a choice between Liberal and Liberal-Lite. Lordy,... what is next ? Lookee what we got, right here, folks.